Last night, The Rocket N00b blog hit 25,000 page views. I started this blog in August of 2014 - less than two years ago. I don't know if 25,000 is a lot of page views for a blog that's nearly two years old, because I have nothing to compare it to. But it feels like a lot, and it's certainly more than I ever expected! Whether you're a n00b to rocketry, or a BAR (Born Again Rocketeer) returning to the hobby after a long hiatus, I hope you've found something useful or helpful on this blog. And if you're a more experienced rocketeer checking out these pages, I hope you at least enjoyed reading it and looking at rocket pictures. I don't always get to post as often as I'd like. I might get busy, and not have much time to write anything worthwhile. On a good week, I'll write several new posts. Sometimes it will have been a couple of weeks since I last posted. Sometimes, if it's been a while, I'm tempted to write something, anything, just so that there's a new post on the blog. But I don't want to do that. Sometimes I'll look at some of the posts I've got started and realize that they'll take a lot of fact checking, writing, and photographs before I'm satisfied with them. Even though this isn't my job, and I don't make any money from the blog, I do feel a sense of responsibility to The Rocket N00b. Rocketry has added a lot to my life, and I'm fascinated by it, so I really enjoy passing along what I've learned to beginners. I don't want to publish something if it's badly written or lacking some key information, because I want a beginner to understand what I'm writing about, even if they have no background in whatever the topic is at hand - model building (tools, painting techniques, what CA glue is or that sandpaper comes in different grits, etc. ), basic rocket science (Newton's laws of motion, center of pressure and center of gravity, etc. ), or any other prerequisite knowledge. So I really try to spell things out, and hope that it doesn't get boring for people who already know what I'm talking about. And I want to add enough photographs to make it visually interesting. Thanks to Chris Michielssen, for all the tips and support. Thanks to the Rocketry Show guys for inviting me to be on the podcast - that was an unexpected, fun surprise. Thanks to Ted Macklin for the encouraging emails and comments, and for inventing the Guillotine Fin Jig. Thanks to Kenn Blade, president of CMASS, for being such a nice, welcoming guy. Thanks to Chad, for inadvertently getting me into this obsession, and thanks to my girlfriend for putting up with it. Thanks for reading. I hope you've enjoyed it. It's made this a lot more fun for me. 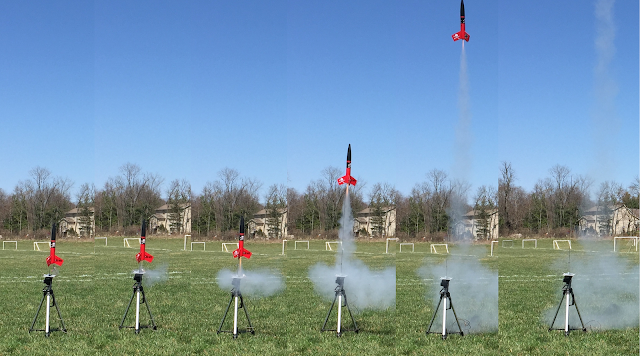 Another mini episode of The Rocketry Show is up. In this episode (which is actually full-length), CG discusses his modular designs. In other words, parts of the rockets can be removed for repair or replacement. These mini episodes are fun to do, and can go up more quickly than a fully-produced interview show. And they're fun - just two or three rocketeers talking rockets. Expect more episodes soon. Upcoming episodes of The Rocketry Show will be NARCON 2016 Part 2, and John Beans founder of Jolly Logic. That'll be a good one. Like my Facebook page for blog updates and more stuff. As detailed in my previous post, I recently completed the Estes Reflector, and despite a few bad turns during construction, I managed to make the rocket look pretty nice. But I wanted to try something I'd read about online - giving the rocket a nice shiny, protective coating, using Pledge floor polish "with Future Shine." Rocketeers often refer to this stuff simply as "Future." The rocket was already pretty shiny before I tried this. I used some Krylon gloss white enamel for the undercoat and some Rust-oleum red gloss enamel for the fin can, and other than a few spots where I wet sanded the paint to remove some flaws, the rocket looked pretty good. But I needed to test this stuff out before trying it on a rocket which was more precious to me. One reason I decided to try this application is that I thought it might be a good, easy way to seal waterslide decals in place with a shiny, protective coating. Perhaps it would also turn out to be an easy way to fix a less-than stellar paint job. With the troubled history of this rocket, and the fact that I tend to fly my larger models more frequently than my smaller ones now, I was willing to risk making a bit of a mess with this rocket, to see if it was as easy and effective as it sounded. I have gotten some pretty good results on my rockets lately. My Estes Astron Sprint XL clone turned out to be as smooth and shiny as any rocket I'd ever built - darn near perfect. My Estes Goblin, too, had turned out very nice. But I thought I might like to add a clear protective layer to seal and protect the decals. On the Astron Sprint XL, this would have been a good idea, as the black band near the nose cone has since started flaking off, and I haven't even flown it yet. I'll need to take that decal off, and paint a black band on. A gloss clear coat - clear spray paint, that is - is an obvious choice for sealing and protecting decals. But I put in a lot of work on these paint jobs, and it included a little bit of wet sanding of tiny flaws in the paint, followed by polishing the rocket before adding the decals in the first place. What if my clear coat came out bumpy and irregular? I'd be hesitant to sand it smooth, as I might sand through it and into the decals. I'd rather put nothing on these rockets than ruin my work. Perhaps Future would be a good solution; it certainly sounded that way, from what I had read. But I wasn't about to do it on my best builds without testing it out first. Before I get to the Future experiment, a word about the build, for those of you who may be building a small payload-carrying rocket like the Reflector. There are several of these model rockets, and they're pretty popular. 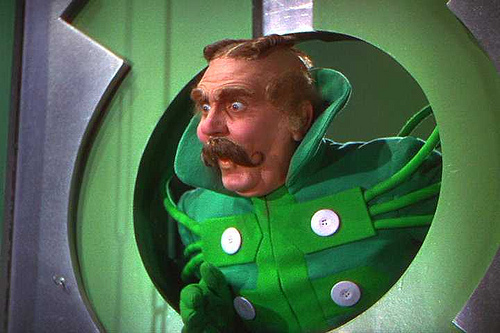 The face card of a lot of these little payloaders touts their "huge payload section." While it may look spacious on the outside, inside the payload compartment is another story. 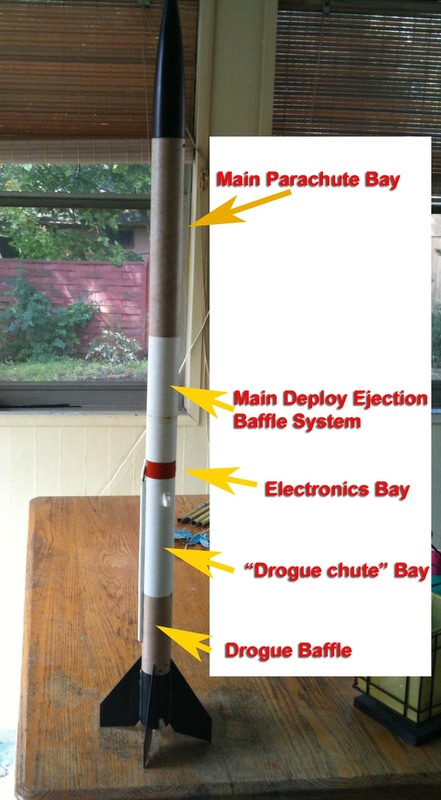 The payload section is made up of a balsa nose cone at the top, a length of body tube in the middle, and a balsa transition at the bottom. The transition allows the diameter of the rocket to get wider at the payload section than the main airframe of the booster. The payload space is therefore inside the body tube, between the transition and the nose cone. As with all model rockets, the nose cone and the transition have shoulders - lengths of balsa slightly narrower than the base of the nose cone or the top of the transition - which allow you to fit them into the payload tube. The shoulders have to be long enough so that the payload section stays together in flight. What you end up with is a space only about an inch long at best inside the payload section. The payload space inside the Reflector. Image from this Instructables project. Not a lot of things you might want to fly will fit into that little space, but you can't simply cut the shoulders off and call it problem solved, or the rocket won't stay in one piece for flight. I wanted to be able to fly my Jolly Logic Altimeter 2, which is about 2 inches long, in this rocket. What I did to accommodate the altimeter was to cut off about half the shoulder on the nose cone, and just a little off the upper shoulder of the transition. I left enough on the transition so that I could still get a good friction fit between the payload tube and the transition shoulder. The big piece is from the nose cone shoulder. The thinner piece is just the conical top of the transition shoulder. The transition piece still has enough length to be safely friction fit into the payload tube. The nose cone would have to be glued on. There simply wouldn't be enough shoulder there to keep the parts together securely. When opening the payload, the nose cone and payload tube are now one piece. But there still wouldn't be quite enough room. Using a drill, I carved out a little niche into the shoulder of the nose cone. Now the altimeter just fits perfectly into the payload section. When you use a payload section like this, you might need to wrap some tape around the shoulders of the transition and nose cone (if you didn't need to glue it on) to get a nice snug fit with the payload tube. You don't want things to pop open during flight and lose your altimeter! Also, it's best to drill a couple small holes, called static ports, into the payload tube. Altimeters use barometric pressure to measure altitude. The payload section needs to be ventilated so the air pressure inside matches the air pressure outside the rocket. Anywhere from two to four holes is recommended. For this small payload section, I drilled two holes, on opposite sides of the payload section, each one 1/16 inch in diameter. If you have a larger rocket, you can do a Google search for "static port hole size" to figure out how big and how many static ports you will need. When trying out a new material or building technique, it's always a good idea to try it out on something inexpensive or replaceable before committing to doing it with a rocket that's really dear to you. First, you want to make sure you've understood how to do it correctly. Sometimes you misunderstand the directions the first time you read them. Also, sometimes a new skill isn't as easy to a beginner as it is to someone who uses it all the time. My first attempts at using paper skins to reinforce and hide the wood grain on fins were disastrous, and I still haven't quite gotten the technique down, even though a lot of people swear by it, and find it really easy. Thirdly, sometimes a thing doesn't work - at least, for you - they way they say it will, or the way it works for them. I'd heard of using Future a few times before, but the most complete explanation I had found was on this thread on The Rocketry Forum. It seemed pretty straightforward, and the basic steps were as follows: Get some Pledge with Future Shine acrylic floor polish and a clean spray bottle. Optionally, add a little bit of Simple Green cleaner (which I didn't use). Make sure the nose cone is separated from the body of the rocket with a little tape, and spray the rocket down till completely wet. Go back several minutes later to remove any drops hanging from the bottom of the rocket with a paper towel, so they don't harden there. A day later, you'll have a shiny rocket. It seemed to make sense, and it sounded so easy! This could be great! I thought. This could change everything. What I pictured happening was that I'd spray the rocket down with the Future, it would level out and all the excess would drip off, and I'd have a nice, even, smooth, shiny protective surface over the whole rocket. What happened when I tried this was different. First of all, though I did blot off the excess that was dripping down off the base of the rocket, I still got a little pool of material on the trailing edges of the fins. As the Future started drying, it became gummy, and I ended up with some uneven, gooey bits. Attempting to dab it off with a paper towel, I merely made it more uneven. Look closely, and you'll see a gooey drip slowly hardening on the corner of the fin. The payload tube also experienced some swelling. You'll have noticed the spiral grooves running around the outside of the body tubes when you build your rockets, and perhaps you've filled those in, as I do, with wood filler. There's a second spiral groove, running around the inside of the tube. I'm not sure how, but the Future seemed to have gotten inside the payload tube, and the internal groove started to bulge outward. The bumpy texture here isn't due to the Future. It's orange peel, and it's a flaw in the paint job that has nothing to do with applying Future. It can be sanded out and polished, but after the trouble I had with this build, I decided not to bother. But you can see the internal grooves bulging through the body tube after Future was applied. According the the directions of the post, the nose cone is supposed to be set loosely on the rocket, or the Future will wick in and glue the nose cone to the rocket. In my case, the nose cone was glued on, so it was the transition I had to worry about. First, I neglected to pull the payload tube apart from the transition before spraying, so that got stuck. But even having loosened the transition from the main body tube and masked it with tape, the whole thing still got stuck together. Once the Future was dry, I tried to pull the payload section off the rocket, and it was firmly glued on! I was determined to get it off there, and while I did get it off, I ended up crushing the body tube slightly and damaging the decals a little from pulling so hard. I got the payload tube and transition separated after wiggling a hobby knife and a fingernail into the joint. There was some slight damage there, but it was minimal. Rather than leveling out and running off smoothly, the Future dried on the rocket in streaks. Some droplets didn't run off at all, and in fact hardened into acrylic blobs which won't come off the rocket. Streaks, looking a bit like sweat, can best be seen on the left-hand fin. The streaks and blobs may be removable, with the use of water and ammonia, but that would most likely take off the decals. The one thing this does seem to have done is to seal the decals to the rocket - and if you look closely, you can see that I had a few loose edges which I was unable to burnish to the rocket surface, so this may at least prevent those from peeling off. But overall, my first attempt at trying this out was a little detrimental to the final appearance of the rocket. So, what could I do differently next time? Well, I could decide that this technique isn't for me. I have been getting better at getting a nice smooth paint job lately, so perhaps I don't need this one. Or, I could try again, but go about it differently. On asking advice on the Rocketry Forum thread to which I linked above, I found a few different opinions (you'll always find a dozen different opinions when you talk rocket building with people). But one thing that a lot of people seem to agree on is that what I did here was too much. If and when you use Future, you need to do so lightly! Some people suggest spraying the Future on, but in multiple light coats. Some people suggest using a foam paintbrush to apply the future in a thin, even layer. Perhaps spraying it on and wiping it off with a clean cloth would yield good results. In the comments section of my previous post, Chris Michielssen says that while he uses Future on his builds, he only applies it to the decals, and he uses a Q-Tip to apply it in a thin layer. Whenever you try out a new technique, the point is that sometimes you have to test it out first. Some things seem a lot easier when you read about them than they are in practice. It may take practice to get the hang of it. Even with something as simple as applying a little Future with a cotton swab, now that I've had this experience, I might first try it by applying a spare decal to a painted surface, and then sealing it to the surface with Future, just to see what it looks like (rather than doing it on a finished rocket for the first time). If I like the results, I may adopt the technique. Applying Pledge with Future Shine to rockets to improve their surfaces isn't a terribly common practice, but some people do swear by it, so they must be on to something. At the very least, they like the results they get with it. Others say they would never use floor polish on a rocket. Floor polish on a model rocket? Not no way, not no how! People in both camps are doing what works best for them, so nobody is wrong! As you look for ways to improve your building, sometimes you'll come across techniques which are a tad controversial. Some rocketeers are pretty opinionated about what works and what doesn't, what you should always do or never do. We'll talk about one of those techniques in an upcoming post, and look at both sides of the issue (and try not to raise any hackles or ruffle any feathers). The point of all this is, when you learn of a new building technique or material, you don't have to take anybody's word for it. Whether one person says "This is easy and amazing!" or another person says "Only an idiot would do this!" you will only know what works for you if you try something out. Just don't try it on anything too expensive or irreplaceable. I'm trying an experiment today, and it's got me nervous. The rocket you see above is the Estes Reflector, a small, BT-50 (0.976 inch diameter) payload-carrying model rocket with a classic "model rocket" look to it. It's... not a big deal. I keep telling myself that. I bought the Reflector when it was on deep discount, partly because I was considering building this model rocket camera payload project from Instructables.com, and the Reflector happens to be the rocket used in the project. I decided to simply build the rocket as a stock kit model, though I did drill a couple static port holes in the payload compartment so I could use an altimeter. I'm not in love with the Reflector - I keep telling myself that. It was just a cheap, simple payload rocket I got so I could play around with it. While writing this, I realized that this was the first rocket I started building after my move from Indiana to Boston last summer. I've been working on this little rocket since July - ten months. 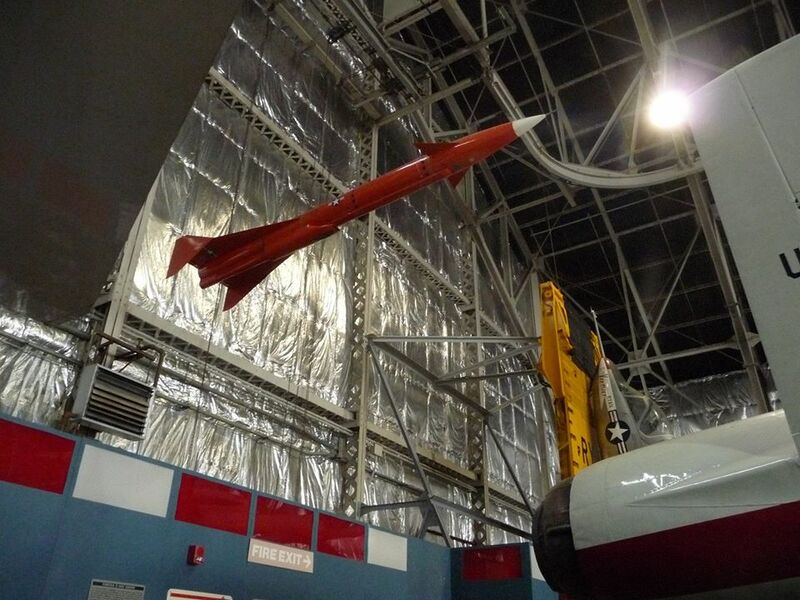 Which is far too long to spend on a little model rocket like this. It's not a big deal. I keep telling myself that. To be clear, I have started and finished other rockets in the last ten months. And a lot of things went wrong on this build, so I really shouldn't care if it turns out alright. I keep telling myself that. To begin with, the fins warped when I filled the wood grain with Carpenter's Wood Filler (CWF). I got them back to mostly flat, but when sanding off the filler, I had a hard time getting the darned things smooth. Photo not found. While attaching the fins, I realized that the thumb tab from the motor hook would have prevented the rocket from standing upright on its fins for display, and I didn't like how far out the hook stuck from the back of the rocket. So, halfway through attaching fins, I tried to clip off the thumb tab. But I didn't have the right tool, and ended up bending the tab badly. This is partly why it took me so long to complete building the Reflector - I kept screwing it up! Unfortunately, I didn't take many pictures of the Reflector build. Since I was having such a hard time with the rocket, I thought I might never finish it, and didn't really see how I'd use it on the blog, and kept telling myself the rocket didn't matter that much. It was a slightly screwed up rocket that I'd probably never finish, and if I did, it probably wouldn't look great. Once I'd started and finished a few other rockets, I decided I needed to get the Reflector built. Each problem I'd created, I seemed able to fix more or less. With plenty of automotive filler primer and lots of sanding, I was able to get the fins relatively smooth. They weren't badly warped - just enough so I had been unable to get all the texture of the wood filler sanded off with a sanding block. Using just a piece of 400 grit sandpaper and my fingers, I got them to where I found them acceptable. Suffice to say that it took me ages to decide how I wanted to fill the wood grain on the balsa wood nose and transition piece. I'd never used a balsa nose before - this was my first! I didn't know if I wanted to use wood filler, creating dust, possibly leaving the pock marks I occasionally don't notice in the surface until the rocket is painted; or sanding sealer - a model rocketry standby that I've only recently started playing with; or something else. I opted for the CWF. Turned out alright, especially after spraying on the primer and sanding it smooth. Almost as perfect as plastic. Fast forward to the painting process. The white went on with little trouble, though I did have to sand a few flaws out of the first layers of white and touch them up with a new can. The black nose cone and payload section got some orange peel on them - a bumpy texture you sometimes get with spray paint, so called because of its resemblance to an orange rind. I considered sanding it smooth and either repainting or trying to polish it, but decided I shouldn't spend so much effort on a rocket which wasn't that amazing and which had already caused me trouble. Because of the payload section, the launch lug has a wooden standoff, and if you put the launch lug where the instructions tell you to, there's not much room between the leading edges of the fins and the trailing edge of the launch lug standoff. That means that in order to get a clean, straight line of tape down where you want the red bottom to stop and the white upper part to start is tricky, because there's almost no space. I usually use clear Scotch tape to mask lines on rockets, because it's cheap and leaves a nice, sharp line. I used Chris Michielssen's trick of marking a piece of tape with permanent marker and cutting through the black with a hobby knife and ruler to get a sharp, narrow piece of tape. Getting a piece of tape perfectly straight around a body tube to create a seamless, perfectly straight circumferential line can be tricky. It took me several tries and three pieces of tape to get it right. You're never really sure until you take the tape off. Once a narrow tape line had been laid down, I had to construct a mask, using blue painter's tape to protect the launch lug standoff from overspray, and paper to keep the rest of the rocket clean. (I really wish I'd taken pictures here). When you mask off a base coat to apply a second color, you first want to seal the edges of the tape down with a thin layer of the original color. My fins would be red, but I'd seal the edges with a blast of white. It turns out that Sharpie markers, the kind I had on hand, while "permanent," are not the best markers for this application. The white Krylon paint melted the sharpie, and I got a gray ooze down the rocket. Also, I got minor paint runs from doing too heavy a coat of paint. I went on to do the red top coat. It was actually going not too badly. A bit bumpy, but not quite orange peely, and pretty much OK. The paint runs were hard to see, so I figured it wouldn't be a big deal. While the paint was still tacky, I began taking the mask apart, starting with the paper, moving on to the blue painter's tape, then finally, carefully peeling back the Scotch tape at the edge, all while trying not to touch the fresh paint on the fins. Then the Scotch tape tore. I could not get all of it off. I have a little bit of fingernail, but I could not lift the tape off. As I became more and more frustrated, I found I was smudging the edge of the paint, getting fingerprints in it, and making a big mess, but I was getting angrier and angrier, and was not about to let the paint dry with bits of tape stuck under the edge of it. (I get really frustrated when I have something stuck to a rocket and can't get it off). From the side, you can see how little room there is between the fins and the standoff. I nearly smashed the rocket with my bare hands. HA HA HA!! WHO CARES?? I NEVER LIKED THIS ROCKET TO BEGIN WITH!!! The problem with being a perfectionist is that you don't have the luxury of not caring. Even if you're building a little rocket that was inexpensive, and maybe not your favorite, is that the process of building is such a pleasure, especially when it's going well. If it goes badly or if you make a mistake, you might tell yourself that you don't like that rocket, and you don't care how it turns out, but it bothers you. Then, if you're able to fix the problem, you are back to feeling good about the project. One thing I've realized when building this rocket is that, even if it's not my favorite, one that I'd been eyeing for months on some website, dang it, I do care about this rocket. There's no rocket build, large or small, where I decide I don't care. But sometimes, to develop a craft, you have to take the risk of ruining your work in order to try a new technique or skill, or even to practice techniques you already use. I've only been doing this for going on two years now, so I'm not an old hand yet. I'm still the Rocket N00b. Also, when you make a mistake, sometimes if you set the rocket down, breathe, and think about it, you can fix things. Even this. First of all, in my frustration, I'd gotten some pink marks from fresh paint on my fingers all over the rocket. No problem. I grabbed a Mr. Clean Magic Eraser (a tip from Chris Michielssen), and got rid of that. Those red smudges were sticky the next day. That told me that there was mushed up tape mixed in there. I knew how to take care of that. The dark marks were either primer (I did take a hobby knife to the rocket while trying to remove the tape) or Sharpie. Again, I had a plan. Mushy adhesive stuff can be removed from dry paint (test before you try on your rocket, but it has worked for me) with a little Ronsonol lighter fluid (as you'll see I found out if you clicked the link above leading to the Quest Quadrunner post). I dabbed a little on a Q-Tip and got most of the gummy red off. It also loosened up the few little bits of tape I discovered once I cleaned off the gummed-up red bits, which I was able to carefully lift off with the tip of a hobby knife. I finally wet-sanded the edge where the red meets the white with either 600 or 800 grit wet/dry sandpaper. Not perfect - but much better than what I'd had before. Also, you can see that I got that tape line perfectly straight, so that was encouraging. Smaller rockets are harder to build, because the details are harder to get right. There is a black decal which goes around the rocket just below the launch lug standoff. You're supposed to leave a bit of white between the black and red, but in this case, I decided the decal would hide the flawed edge. It would be slightly different from the stock look of the rocket, but it would look better this way, and that one little detail would make it my own. I finally ended up with a rocket which didn't look too bad, considering everything that went wrong. I could have left well enough alone, but I decided to try one more thing. Not that I don't care about this rocket, but I figured this one, with all I messed up and all I was able to fix, would be the ideal candidate to try a treatment I'd read about, before using it on a rocket I really cared about. The experiment I'm trying is to make the rocket shiner, using Pledge with Future Shine - a floor polish which is said to give a high gloss shine to your rockets, and I hope may seal the decals in place and protect them from damage. Doing something I've never tried like this is a little scary. The Reflector has gone from being a problem build to a pretty nice looking little rocket, and now that it's done, I don't want to mess it up. But I really don't want to try it for the first time on a more expensive rocket or one I'm really attached to. How will it turn out? We'll see in the next post. But sometimes you gotta break a few eggs. The NARCON 2016 Part 1 episode of The Rocketry Show went up yesterday. 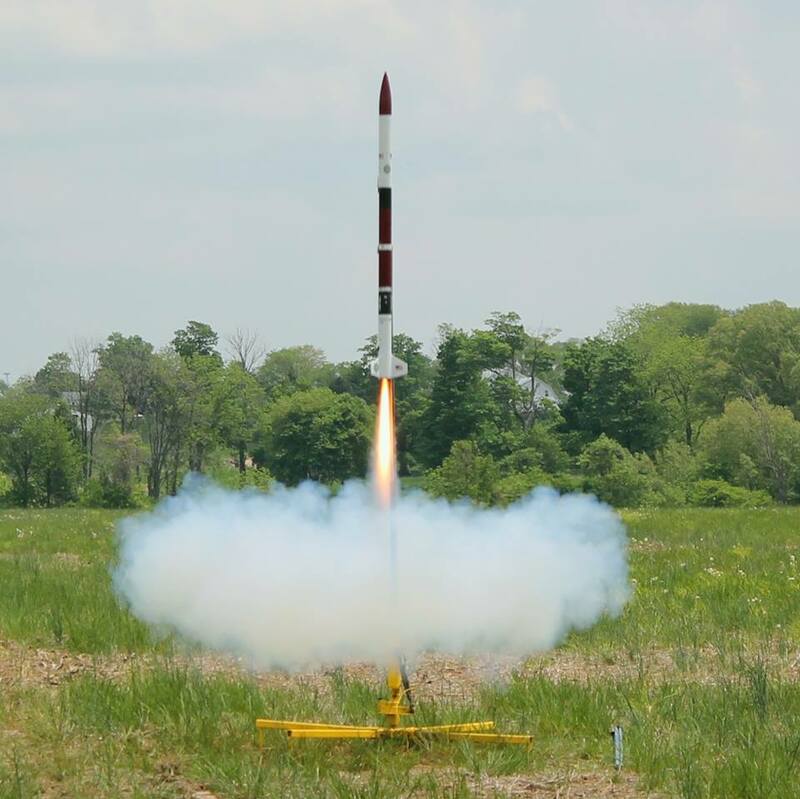 NARCON - the National Association of Rocketry's annual conference - was a couple of months ago, but some of these shows take time to put together. Still, if you weren't able to attend NARCON this year, a lot of this stuff will be new to you, and it's a good episode. Part 2 will follow soon, and there will be another mini-episode with CG and Gheem (I had to miss the recording) in a week or two. If you click through to see it on YouTube, you can also see the other presentations recorded by the YouTube user Nerys. Lotta good stuff there, on rocket history, construction techniques and other stuff. I hope to attend next year's NARCON, as well as NARAM (won't be able to go this year). In the mean time, I've got lots of rockets to build! At my first club launch in April, I flew a newly-finished, scratch-built rocket: The Ceres B booster with the "ICU2" camera payload bay. The original design is from Mike Westerfield's book, Make: Rockets: Down-to-Earth Rocket Science. It's a largish, BT-60-based rocket (about 1.637 inches in diameter), with four trapezoidal fins and a fatter, BT-80 (2.6 inches) payload section. The payload houses a hidden camera, with plenty of room left for an altimeter - and even an egg or two if you want to launch that. The hidden USB spy cam tucked inside. The camera only cost about $5. You can tape a miniature camera to the side of most rockets and get some fun video. What I like about this rocket is that the camera is part of the design; it's hidden from view and isn't just stuck on the side. The rocket, as designed, is a basic model rocket with a 24mm diameter motor tube, and can fly on either D or E black powder motors. I had quickly built a 3-finned version some time ago, and lost it on its first flight with an Estes E9-6 motor. I lost the payload earlier than that, on an ill-advised flight of another rocket I'd designed. The payload was on its own, far too large parachute, and the wind carried it away. I decided to soup up the design a little, replacing the traditional motor hook with an Estes Quick Release screw-on motor retainer, and leaving out the engine block or thrust ring. With a nice, long motor tube and no hook to get in the way, the rocket is now very versatile, and can fly on anything from a D12 black powder motor up to F and even a few G composite motors, giving it an altitude range of 440-3100 feet. The fins were built up from three pieces of material, making them nice and strong, and have a fin root tab for through-the-wall construction, firmly attaching them to the rocket. The fins also have beveled leading and trailing edges, and are radially-tapered, meaning they get thinner toward the tip as they radiate out from the body of the rocket. At the roots, the fins are about 1/8 inch thick, and about 1/16 inch thick at the tips. This not only makes them more aerodynamically efficient, it also looks really cool on the finished rocket. Apart from a couple problems with the finished paint job, I'm really pleased with the way this rocket turned out, and plan to try flying it on many different motors. My order of AeroTech composite motors did not arrive in time for my first launch, so I had to use an Estes E9-6 for the first flight. I still got a really good video of it, and the rocket came back with no damage. Jolly Logic has even put the video on their website, because I used both the Altimeter Two and the new Chute Release in this video. I'll show some of the things I did to build this rocket the way it is in a future post. If you're interested in building the design, check out Mike Westerfield's book - even built as a basic model rocket, it's a good one. When's the Next Episode of The Rocketry Show? 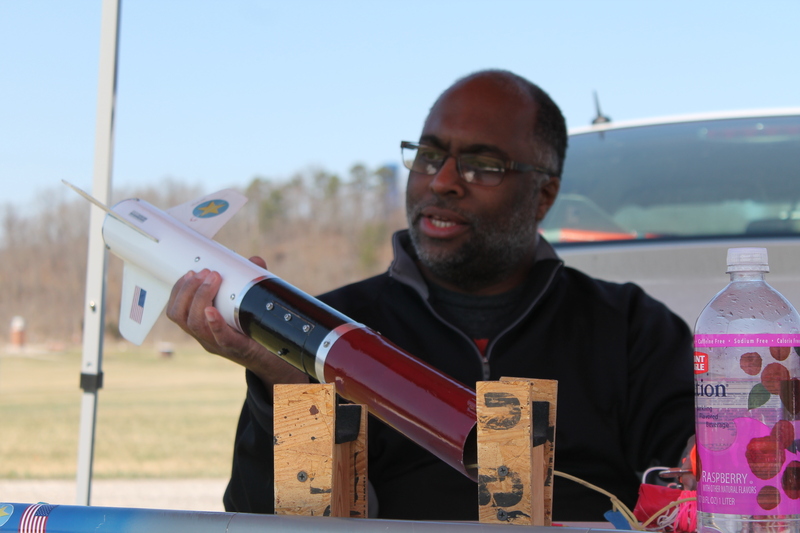 We've recorded a number of great episodes of The Rocketry Show podcast recently. If you're a subscriber, you may be wondering what's taking so long to get these episodes out. With the interesting guests and topics we've had lately, plus the workload on CG, our host, producer and editor, some of the material takes a bit more time than usual to put together into a finished product. But tonight, CG and I recorded a short episode which will be out by midnight. We plan on releasing a number of shorts in the future, between the regular, longer episodes. Sometimes, it's nice to just sit back and talk rockets - which is what we did. Like my Facebook page for blog updates and extra features.